The Stiebel Eltron Tempra 24 is manufactured by a German company, known for its cutting-edge water heating solutions. This water heater stands out for its better flow rate and power consumption options. It sets the standard for how you use hot water without wasting too much water and energy. It has two flow rates between 0.58 to 5 gallons per minute. Which means you can run two taps at the same time while having your desired water temperature. 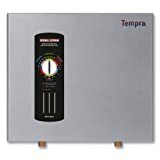 If you want something more powerful – go for the Tempra 24 Plus version with 99% energy efficiency and stronger flow rates. The Rheem RTGH-95DVLN helps you solve your water heating problems instantly. It’s an energy efficient, stainless steel, and eco-conscious competitor with a high price tag. It’s higher than most other competitors. This is a low NOx version using up to 38-feet of PVC pipe or 5-feet of 2-inch PVC pipe. It has a huge water supply, a good flow rate, and better temperature settings. If you want something that’ll lower your energy bills, this is your ideal heater to buy. It has self-guided instructions for self-installation. So, you do not have to spend more than the cost of the product. The Bosch Tronic 3000 is an excellent choice for budget-minded buyers. It is electrically-powered and has a mini-tank which acts as a storage for 2.5-gallon per minute point-of-use performance. The best part about it is the fast recovery rate which reduces the time you having to wait for hot water to reach your tap. This compact and portable water heater has more tricks up its sleeve than what one might think. Which is why it has been promoted as the best budget pick on this list. The 120 volt outlet, dual supply performance, and CFC-free foam insulation is good for bathrooms, kitchens, RVs, and small apartments. A non-storage unit uses continuous flow to heat water through the device into the taps. It does not store or re-heat anything for future use. Most traditional and modern units consist of copper heating elements. These offer easy thermal conduction and fabrication. Plus, they prevent limescale, mineral, calcium build-up. There are all kinds of on-demand models such as hybrid, point-of-use, and combination broilers. But what’s more important than this categorization is knowing which is gas-powered and electric-powered. Continuous circulation: In this method, the unit constantly pumps water through the water inlet to each corner of the unit. However, this spends more energy than required and was the first kind of technology for heating systems. People are now opting for more modern and energy-efficient on-demand heating technologies. 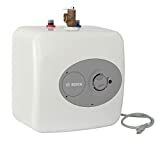 Timer-controlled: When a device is time-controlled, it consists of a re-circulating pump which shuts off heating water when the timer goes off. Once the timer is on track, the heating element is activated and cold water is treated. This is one of the most efficient methods and also helps reduce consumption of water. Pump: For pump-driven models, a pump is installed under the sink which can be turned on with a push of a button. Once it is turned on, the pump uses most of the hot water supply from the unit. This kind of technology is good for when you want single use only. The best tankless water heater comes with a heating element which continuously heats water and supplies it to your home’s main pipeline. This heating element is also powered by the unit’s power source, which is either electric or gas-powered. When you turn on the tankless water heater, the unit uses minimal energy (unless it’s not energy efficient) to supply a continuous stream of hot water for as long as the tap is turned on. These features work something like this: When the switch of the unit is turned on, the sensor that’s placed in the heating element of the electric-powered heater kick-starts the burner. The burner heats the water flowing in the unit in a constant cycle, while the thermostat maintains the desired temperature of the water flow. When using natural gas or propane heaters, make sure the unit has enough ventilation support for smooth performance. It can be placed through a ceiling or outside the house, close to all the main pipelines. Hot water is the only priority when using the best tankless water heater. And so, you shouldn’t have to wait a long time for hot water after turning the tap on. That said, opting for a larger tankless water heating system that can run two taps, such your dishwasher line and a kitchen faucet, simultaneously is important. This tankless water heater review takes one of the most important factors into consideration – which is the energy factor. The energy factor determines the way the heating system works and how much cost you have to pay for its installation, maintenance, and in electricity bills. The other side of the coin is how much power does the unit consume to continuously supply hot water. A storage tank unit is supposed to be working 24/7. The tank constantly keeps filling water while the heated water flows to a tap as needed. When a tap is opened for supply, the tank pushes it out of the tank to the tap. Meanwhile, another tap connected to the tank is filling it with unheated water. This makes a tank heater more effective, but more energy exhaustive. Storage tanks come with thermostat which is used to maintain the ideal temperature. They also come with a pressure relief valve to ensure proper flow. The competition between gas and electric tankless water heaters is still going strong. Tankless water heaters are valuable and practical systems. But if you want a basic run-down of what’s cheaper and more cost-effective than the other, here it is. Based on what consumers buy, gas-powered units are costlier than electric units. This is because gas-powered units require additional equipment, separate pipe fittings, and enough ventilation for proper performance. Electric-powered units, on the other hand, need to be only installed on the ceiling or a wall with proper connection. Small electric units are smaller in size and feature a comparatively smaller GPM flow rate. Hence, they cost a few hundred dollars less than big gas tankless water heater with stronger GPM flow rates and temperature settings. You have an existing gas line in your house to spare. If you have been using a gas line for a tank water heater, it can easily to re-routed to your tankless water heater by a professional. Make sure you have the right gas pipe size and fitting for the tankless water heater. You have enough wall space and ventilation for installation a gas-powered unit. You do not have enough space to accommodate a bigger heating unit. You have specific requirements when it comes to flow rate and temperature settings. You do not want to insert an extra gas pipeline in your home to accommodate a gas-powered unit. You want a compact water heating unit in only one area of your home. There is an electric panel in your home with the essential hard wiring for constant power supply. The Stiebel Eltron Tempra 24 gives you energy efficiency and constant hot water supply. It is the best electric water heater on the market. It comes with an auto-modulation feature which helps save money in the long run. Also, a durable copper heating element which is designed to last longer than most other materials. The heating chambers that copper is housed in activates effectively without compromising on quality. And neither does it cause mineral or scale build-up inside the chambers. 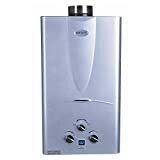 If you want something that gives you consistent supply of hot water at a good price, this is the best tankless hot water heater to get. The Stiebel Eltron converts cold into hot without making you work hard for it. The Rheem RTGH-95DVLN holds a fantastic record among other water heater reviews. It is an indoor direct vent heating system that uses natural gas as its primary power source. It comes with a durable remote control for accurate temperature control. The best part about this upgraded pick is that it’s environmentally-friendly as it has low NOx emissions during performance. This means it converts cold water into hot without leaving a definite footprint behind for a gas-powered unit. Gas heaters like this one have accurate temperature settings. This is what makes the Rheem an efficient and reliable contender, to begin with. Moving forward, you can even make use of the gas hot water heater unit’s self-guided instructions for installation. This best pick operates efficiently at elevations higher than 5,000 feet up to 10,000 feet. The stainless steel heat exchanger is impressive and keeps everything consistent for you. As for a cheaper alternative, the Bosch Tronic 3000 makes the final cut. It’s our ideal runner-up pick. It’s a mini electric water heater with dual GPM options: between 2.5 to 7 gallons per minute. The water tank is sturdy, durable, and keeps out of the way. This is essential for people with smaller homes who need hot water supply only in the bathroom or the kitchen. You can keep it under the sink, in a cabinet, or right next to your bathroom faucets. For a compact unit, this best tankless water heater offers a good temperature rise and heat exchanger. It’s the best electric hot water heater for a good price. 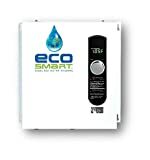 The Eccotemp FVI-12-LP is a propane tankless water heater. It has a much higher capacity than standard propane on-demand systems with 0.93 to 4.8 gallons per minute capacity. The sleek modern design of this demand water heater suits all aesthetics. It features a digital temperature display with both gas and water controls. This temperature controller is what makes the unit an energy efficient competitor. With the smallest dimensions available, it’s easy to install and needs only two knobs for fitting. The fittings include a water inlet, outlet, and gas outlet valve. The LCD screen is ideal for temperature control when you most need it. The SioGreen IR260 POU uses infrared technology with no limescale or mineral build-up qualities. This model comes without maintenance costs. So, it makes up for its initial cost over the months. Moving forward, the built-in temperature control is accurate and effective. Infrared heating is impressive because it prevents water from coming into contact with the heating elements. This makes the heat exchanger much more effective at what it’s supposed to do. Hence, there is no corrosion, mineral, or scale build-up. This completely eliminates maintenance and helps you save more money. It has 4 manual power levels that control the amount of power of the heating element. It fits most applications for kitchen and shower use. The Rinnai RUC98iN Ultra Series is a high-end tankless water heater. It’s one of the few models offering dual installation choices of concentric and PVC pipeline. The Rinnai has a good concentric vent design to maximum air ventilation. Plus, Rinnai is known for its ultra-low NOx emissions which means the Rinnai tankless water heater the safest option out there for children and pets. The maximum power supply feature ensures consistent performance. While the space-saving design of the Rinnai ensures indoor installation too. Not many gas-powered, natural gas heating systems can be installed indoors. But the Rinnai is clearly a reliable exception. 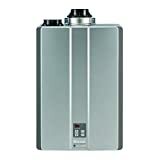 It is one of the best tankless hot water heaters to buy. The Marey Gas 10L Digital is an affordable option for most people. It is also an eco-conscious choice which operates on battery when kept idle and gas when used. With a minimal footprint, you won’t miss using tank models with this around. It has a compact digital panel for temperature display. And a 5-year distinctive warranty to remain both cost-effective and practical for budget buyers. We like this for its quick heat and control settings. The heating elements this model uses are good for long-term use too. And the elements in the water tank use 60% less electricity and save space. The Takagi T-KJr2-IN-NG Indoor is a good choice among indoor users. It has a maximum 6.6 gallons per minute flow rate. Takagi’s stainless steel vent design saves space and also remains unbreakable for longer. The Takagi is both efficient and accurate at what it does. With a good energy factor of 0.81 to 0.83, Takagi uses natural gas to supply heat water. The Takagi turns cold water into perfectly heated water without causing standby loss of cold water sandwich. 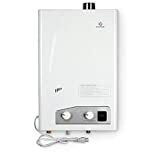 The Takagi is the best tankless gas water heater for radiant heating use and other applications. The EcoSmart ECO 27 is a smart choice for most people. It uses electricity to supply continuous hot water. It also comes with a unique power modulation feature which tackles excessive energy use depending on how often you’re using it. The patented modulation feature of this tankless electric water heater can save you 50% of your energy costs. Meanwhile, the powerful amp and compact size keeps your unit activated for longer. The copper and stainless steel components make the unit strong. And the digital control for temperature make it effective. What more do you need in an energy efficient and smart heating system? The Rinnai RL75iN is second best to most brands out there including Takagi and condensing tankless water heaters. This point-of-use water heater ensures safe and effective performance. All thanks to the digital temperature controller with error code indicator and powerful BTU compatibility. This natural gas unit uses the best temperatures for residential and commercial use. For example, it has 98 to 140 degrees set for residential use and 98 to 160 degrees set for commercial use. 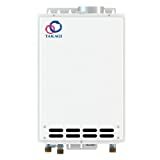 Which makes it the best commercial tankless water heater on the market. For tankless water heater reviews, research and testing is very important. Choosing might be tough, but buying is certainly easy with the help of this guide. We have covered all key components of a tankless water heater – flow rate, temperature rise, price, and size. Different models of on-demand heating systems came with all kinds of features such as auto-modulation, temperature controller, pressure relief valve, and error indicator. These features help you enhance performance and reduce maintenance cost. If you want no maintenance cost at all, opt for infrared technology which separate the water running through the unit with the copper or quartz heating element. After buying the best, you should know that installing tankless water heater is not as simple as you think it is. To better understand these key functions, read on below. What are the pros and cons of using a tankless over storage water heaters? Consistent water supply: With the help of faucets, a tankless water heater flushes out cold water in order to supply continuous hot water. This is the only way on-demand water heating systems can offer a constant supply of hot water without the use of storage tanks. Durable: These units are designed to last for a longer time than tank water units. This is a noteworthy advantage because most tankless water heaters last for longer than 10 years, requiring maintenance less than 5 times in a decade. Cost-saving: Maintaining tank water heaters is costly and if you’ve used them for more than 2-3 years, you should know that the maintenance costs increases from there. On-demand water heaters are more efficient than standard units. They help you save more than hundreds in maintenance annually. Less space consumption: This goes without saying that tankless water heaters take up much less space than tank heating systems. If you want to avoid bulky storage systems, installing on-demand units on walls is a better option. The best part about using such units is that they can be installed almost anywhere in your home. Efficient: Being energy and performance efficient, the best tankless water heaters qualify for financial tax credits which is good for cutting back on installation costs. No standby loss: If you’ve used a storage water heater, you’ve definitely heard of the term “standby loss.” Standby loss is when a unit re-heats water in breaks to make sure the water is hot when you use it. This continuous re-heating of water contributes to energy loss which digs a hole in your energy bills. But this isn’t the case with tankless water heaters because they’re an immediate on-demand service. Immediate hot water supply: In the best tankless water heaters, you’re never going to run out of hot water to use. That’s because these units do not have to rely on storage tanks for supplying continuous water and the hottest temperature. Dual models: With tankless water heaters, you get both electric and gas-powered models. Warranty: Such units also offer extended warranties on all of its components including the pipeline. So, in case of damage or improper performance, you do not have to pay additional maintenance costs. Good for smaller houses: Lastly, on-demand heating systems are best for smaller homes with minimal hot water demands. Opting for tank heating systems for a studio apartment, for example, would be a complete waste of money as tank units are built for bigger families with versatile hot water requirements. Plus, you would find it hard to find a suitable place to fit the tank in as most studio apartments or smaller homes come without a common basement or extra storage space. 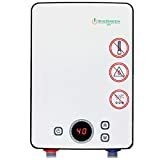 Irregular water temperature: If there’s one thing you need to be concerned about when choosing the best tankless water heater, it should be inconsistent temperature. Higher installation cost: Installing an on-demand unit is expensive because you need specialized service for proper installation. When you’re budgeting the initial costs for the tankless water heater, make sure you feed in the labor costs too. Limited water supply: What this means is that if you’re going to use hot water in your kitchen, you won’t be able to take a shower at the same time. Most models accommodate only a single use at a time because of the limited storage space in tankless models. Additional equipment: During installation, you might have to spend an extra amount of buying specialized equipment such as a water softener, recirculation pump, and other tools for enhancing the performance of the unit. This adds to the overall cost of the best tankless water heater. Gas heaters are costlier: If you buy a gas-powered water heater, you need to spend extra on installing a separate gas line, which requires better venting- this adds to the cost of the unit. Need more service attention: On-demand units have prone to sediment build-up more often than tank units. This depletes the unit’s efficiency which has a direct effect on flow rate and temperature consistency. Hence, tankless water heaters need more attention for enhancing efficiency and performance than tanks do. Slower hot water supply: It’s true that for some tankless water heater units you need to wait a few minutes before you get a continuous supply of hot water. This isn’t true for tank units. Tank units keep the stored water heated and ready for use. Does the tankless water heater work if the power is out? No, a tankless water heater- be it natural gas or propane- needs constant electric supply. An on-demand unit works after getting powered by the electric panel board to activate the heating element. Most units come with sensors that detect constant power supply to activate the burner which heats water as it passes through the system. The standard power outlet of most electric water heaters is 120V AC. If you experience power outages very often, opting for a storage tank model is essential. However, you can opt for other power sources such as solar energy to power specific types of water heaters. You can contact your professional plumber for hooking up the new model. For a non-electric model, natural gas or propane, a solar source would push the unit to work for some time. Can I repair the tankless water heater on my own? Make sure all the water inlets and outlets connected to the unit are turned off. Turn of the circuit breaker off, if you have a gas-powered heater. Pull the pressure relief valve off. Add the white vinegar into the bucket and place the sump pump in it. Hose the water inlet toward the submersible pump and connect both of them. Hose the pressure-relief valve and allow it to pass to the bucket. Make sure to pump the vinegar through the unit for 20 minutes. This is good for preventing any scale build-up and mineral build-up in your heater. After 20 minutes, turn the pump off and remove the inner filter housing of the unit. Clean all the filters or replace them with new filters, if needed. Remove all the vinegar residue from the device by pumping out the heater into the bucket. Run clean water through all the valves of the unit with the help of the submersible pump. Use the same method as before. Turn the power switch on after a minute or two. If the water is getting too hot or isn’t hot enough: Make sure you have set your desired temperature to the ideal degree, which is between 105 to 120-degrees. This is the recommended temperature for hot water. If you have pets or a baby around, you can reduce the temperature down to 90 to 100-degrees for safety. Another reason why the water must be irregular is dirty or clogged filters. You need to flush out your water heater (follow the instructions above) to ensure smooth performance of the unit. If there’s no hot water at all: Make sure the power supply to the unit is consistent and working. And make sure the switch board is kept a few meters away from the unit for preventing heat build-up or moisture. You can also inspect the unit’s shut-off, inlet, and outlet valves to make sure the minimum flow rate is consistent to activate the burning element of the unit. If you want to connect your tankless water heater to the kitchen faucet and, simultaneously, to the shower head, you need a consistent flow rate. The ideal flow rate of a shower head is and should be 2.5 gallons per minute. And the ideal flow rate of a kitchen faucet is somewhere between 0.7 to 1.5 gallons per minute. If you’d like to have to option to run both the kitchen faucet and the shower head together, that makes the unit’s flow rate at around 3.2 to 4 gallons per minute. On the other hand, you can install low-flow fixtures to reduce the flow rate demand for water heaters. The flow rate of a water heater is directly associated with its size. For stronger flow rates, you need a bigger unit. In warmer climates, your water temperature is most likely to be higher than normal. Based on studies, the average water temperature rise for heaters is 105 to 110 degrees. And the average temperature of un-treated water is 50-degrees. So, you need a temperature rise of about 50-degrees from the desired unit. When you co-relate both measures, a standard water heater provides 2.6 gallons of water should be around 104 to 106-degrees. Let’s take an example to better understand the relationship of water temperature with flow rate. If you want to run to shower heads at a time when your water temperature is at around 50-degrees, you need a 50-degrees raise of water temperature from the tankless water heater unit to meet the ideal 104-degrees temperature. So, you will need a unit that is able to produce a 50-degrees rise in temperature and has a running capacity of at least 5 gallons per minute. Determining the right price before buying is essential when looking for on-demand water heating systems. Many people think that tankless water heaters have a basic task which is to make water hot, so price is not the deciding factor for them. That may be right for other on-demand appliances, but not for on-demand water heating systems. You need to know the type of heaters you’re going to get based on the price you’re willing to pay for it. We’ve narrowed down each budget for you so you can make an informed decision. Buying under $100 dollars means buying the lowest priced tankless water heater on the market. There are plenty of models to consider under this price range, but not many to rely on. This is because low prices often come with feature or performance limitations. 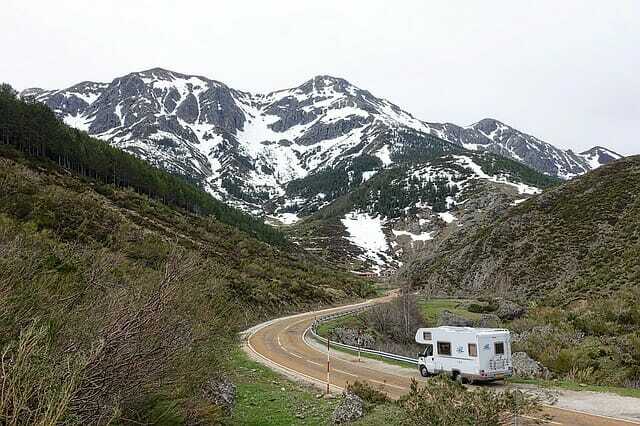 For example, propane-powered on-demand heaters often work in warmer climates only. And they’re often designed for tap water heating and not shower. This can be used in sinks all over your house. But you’re going to need something much stronger for hot water showering. That said, some lower priced models often come with complicated installation, especially those that are gas-powered. Keeping that aside, buying under $100 is not a bad idea unless you don’t know exactly what you want. When you do, you can choose the features you won’t rather than compromising for price. Yes, $50 can be a huge difference when it comes to buying the best tankless water heater. This slightly higher price range can give you models that are best for fewer home showers. You can also buy electric tankless water heaters with less exhaustive power consumption on a day-to-day basis. Most electric tankless water heaters fall under this price range. Here you will find comfortable and quick installation, energy efficient, faster performance, and durability. Models that are under $250 offer hot water on-demand and must be within 50 feet of use. Such models are good for smaller homes where each room has its own bathroom. It also helps when you want hot water in your kitchen sink that’s close to another bathroom. That way, you won’t need two separate on-demand heaters when you can install one within 50-feet range. Twice as expensive as our previous price range, models under $500 are both gas-powered and electric. They offer excellent water flow rate and come with special features such as battery indicator, temperature settings, and automatic shut-off features. If you want something durable and efficient to use, you might find models best suited for you in this category. Models under this price range are experts when it comes to providing on-demand hot water and strong flow rates. You can get hot water from multiple outlets, at the same time, and with temperature settings. Brands that sell models at this price are often backed by impressive customer service and extended warranties. What are the common problems of water heaters? As with any appliance, tankless water heaters come with their own performance baggage. Such systems use minimum storage space and have maximum performance value. Hence, when replacing convention heating systems with tankless systems, it’s important to be aware of the following problems and how to address them. On-demand heating systems often are slow or inconsistent: This is a major concern among tankless water heater users. Models often fail to provide consistent water temperatures. A quick solution to this would be to request a plumber to install a recirculation pump to the main unit. With a recirculation pump, the water that’s heated by the water heater comes out hot from the very beginning and continues to recirculate for as long as the tap or faucet is running. This ensures consistent hot water temperatures. Difficult or incomplete installation: Old-school water heaters that were tankless were often too complicated to install. So, switching from tank to tankless water heaters was often frowned upon by homeowners. But since recent times, reputable brands are adopting new ways to install pipes and knobs on their units. For example, one unit has the hot and cold-water tap placed on the top rather than the base of the heater. This simplifies the water flow from the top to bottom of the tank. Using flexible pipes whenever possible is also a good way to tackle complicated installation. Flexible pipes are much more efficient, durable, and portable than PVC pipes. Tankless water heaters require constant maintenance: This may be true for lower-priced models that require constant cleaning and unclogging. But newer models are often backed by durable standards which allow them to remain maintenance-free for at least 1 year until they need to be serviced. The most common problem that requires maintenance in heaters is scale build-up. This happens in homes that use hard water. Hard water decreases the efficiency and flow rate of pipes, unless they’re maintained properly. With the help of isolation valves, maintaining and cleaning pipes emerging from tankless water heaters is much simpler and easier for homeowners. You no longer have to spend money on hiring a plumber to get the job done. Tankless water heaters save space and money for the long run. You can buy based on capacity, type, flow rate, or even price. But almost all on-demand water heaters come with maintenance costs. A good way to make sure you do not spend more than necessary on such systems, look for models with warranty. This means buying from a top-tier brand with excellent customer care service. Make sure the unit you buy has a warranty and you are able to read each pointer on the warranty beforehand. What parts of the tankless water heater are under warranty and how often can you schedule a servicing appointment with the brand’s customer care? Asking these questions, whether you’re buying from a physical store or online, is necessary. It helps you cut backs costs and reduce power consumption of your home. Why is flow rate important in tankless water heaters? The flow rate is the most important factor in a tankless water heater. We’ve already mentioned the importance of determining the flow rate of a heating unit multiple times in this guide. The flow rate is the total amount of water, measured in gallons per minute, that flows through the water heater. Most modern heating system manufacturers will give you the maximum flow rate and minimum flow rate of their models. The minimum flow rate is the minimum water requirement that is enough to activate the heating element of the heating system. The least amount of water flowing through the unit whilst getting heated is somewhere between 0.1 to 0.9 GPM. The maximum flow rate is the maximum water requirement that is good for supplying hot water to different taps and faucets. This measure can be determined by consumers while keeping in mind the number of faucets you need hot water in. Flow rate is directly affected by temperature in such a way that if the unit needs a lower temperature rise, then the flow rate of that unit would be fast. And if the unit needs a higher temperature rise to meet the desired hot water supply, then the flow rate of that unit would be slow. This is because the unit takes a longer time to heat the water in the latter than the former. After finalizing all tankless water heaters reviews, we have found our best pick of the year – the Stiebel Eltron Tempra 24. It is an electric and energy-efficient contender that is German engineered to perfection. With water control and temperature control features, this helps maximize performance and durability. It turns out that the Stiebel Eltron translates your cost into savings over the years by minimizing maintenance and energy costs. Isn’t that great? !